This article was written by Michael Eley, published on 9th February 2015 and has been read 2894 times. Michael studies Spanish and Philosophy at Cardiff University. He has finished his first semester at La Universidad de Castilla-La Mancha, Ciudad Real, Spain and has just started my second. He&apos;s also blogging about his experiences at his blog, Farther Than The Sun. As far I understand it, the vast majority of Year Abroad students really love the idea of going to the much larger cities of a particular country, be it Madrid, Barcelona, Valencia etc. But for me, you really get a much more unique experience if you go to one of the smaller places in the country. Ciudad Real is fantastic because it has a thriving Erasmus community, you’ll have plenty of opportunities to practise Spanish and you’ll be able to differentiate yourself from others because you’ve gone to a less well-known location. I’ve been here for about 5 months and I love it more and more every single day! Not only is Ciudad Real an amazing location, it’s one of those places where you can really feel the sense of community throughout the city and you’re able to feel really at ease there. The cost of living here is super-cheap! I’ve heard that you pay far less in Spain in comparison to a lot of other countries in Europe. There are plenty of affordable apartments for Erasmus students and of all the ones I’ve seen, they are in fantastic condition! 1. Go the city/town you are going to be staying in before you start your Year Abroad! This was quite important for me because that way, you won’t get the initial shock of everything as you’re starting your placement when you’re trying to settle in and make friends etc. If you get to know the place during the Summer beforehand, you’ll feel much more at ease when you properly start everything off! Look at places online but don’t quickly buy somewhere. I don’t see any problem with booking into a hotel for a week when you arrive and then looking for apartments. 3. Live with Spanish people! I think this goes without saying really, but I think this could be one of the most important things you do on your Year Abroad. With this you have such a simple opportunity to practise your Spanish and if, for example, they have friends over you’ll have even more opportunity to speak in Spanish and above all, improve it! If you can’t find Spanish people to live with, it’s not the end of the world; however, you should still try to live with other Erasmus students who also speak Spanish, as then you’ll still have the opportunity to speak the language. My point is, in whatever capacity, make sure that Spanish is the main language spoken in your apartment when speaking with flatmates. When I arrived here in September and enrolled at the university, I was asked if I was interested in giving English lessons to Spanish natives. At first, I wasn’t too keen on the idea, solely because I had no experience in teaching, but then I thought why not? It’s something new and exciting, it’s a bit of money in my pocket and also I can speak some Spanish along the way! Since then, I have had an array of emails for job offers, private teaching and even having the opportunity to work in the university’s International Office! 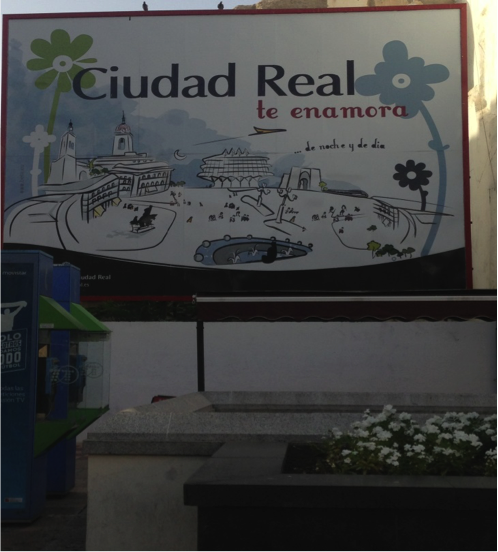 Because Ciudad Real is a much smaller Erasmus location, and with only around 5 students here from the UK (yes, five), there will be a lot of love for English speakers from the Spanish natives and they will be very interested to learn not just about the language but about the culture itself. The Erasmus community here in Ciudad Real really is second to none. It may be a small place but you really do feel the sense of community amongst the other Erasmus students! There are people here from the UK, France, Poland, Italy, Germany, Ireland, Turkey; the list is pretty much endless and you get to appreciate so many different cultures and even learn a little bit of some other languages along the way. The Erasmus Network for this year always put on a large range of events from dinners to parties to trips, you name it! I cannot recommend Erasmus in Ciudad Real enough! For those who don’t know, there’s a fantastic high-speed train network throughout the whole of Spain, meaning you can get to certain parts of the country rapidly at affordable prices. It takes less an hour to get to Madrid, only 2 hours to Malaga and there are trains going every day to near enough every region of Spain! I’ve had the pleasure of visiting Toledo, Córdoba and Granada as part of Erasmus and plan to visit as many places as I can in the next few months! It’s also good to take advantage of the low prices for flights to different parts of Europe as well. I’ve heard of people taking a weekend to Paris and Amsterdam, amongst others, and because it’s easy enough to get from Ciudad Real to Madrid Airport, it’s an opportunity you wouldn’t want to waste! 1. Don’t worry about studies too much! Yes, of course, work hard when you need to, but the whole purpose of a year abroad/semester abroad is so that you’re fully immersed into a culture that is completely different from your own and to also practise your language skills which are obviously invaluable towards your degree, your future and just your social life in general! 2. Don’t feel down if you feel like you’re not improving in your languages! Language learning never ever stops - it’s a progression. Fluency, of course, is the goal, but it’s so important to take everything step by step, otherwise you’re putting far too much pressure on yourself. Putting in the hours and speaking day-to-day in the language should never stop! Are you worried about the language barriers? Then why not make that a motivational factor, turn the negatives into positives. I sometimes still get nervous when speaking Spanish and at times I get that ‘shaky voice’ feeling where I feel like I trip over my words, but that’s obviously a natural feeling for some people so just keep at it and don’t give up! 3. Have a thick skin. This is vital because you might have times where you struggle with the language and notice that people get/look frustrated at the lack of flowing conversation. However, don’t let this get you down. The Year Abroad is exactly what it says it is - a year abroad, a year away from your home country and so you’ll have to be strong and be confident to deal with any hurdles you might face. Having a thick skin will allow you to enjoy and appreciate the experience even more! 4. Your family/girlfriend/boyfriend/pets/friends will still be there when you get back! For me, the hardest part of coming to Spain was being away from everyone I love back at home. I’ve been with my girlfriend for nearly four years as well and going from seeing each other practically every day to only once every few months was such a difficult thing to process. But, you should never forget why you’re doing a Year Abroad, I mean, yes of course, there are really difficult moments, but you’ve got to make the sacrifices in order to appreciate the moments of the future. Everything works out fine! Just simple things like Skyping every evening or every other evening will put you in a much more positive mind-set. Also, take mementos that remind you of that person like a photograph, a love note, a teddy bear or whatever! 5. Make the most of everything! As with any Erasmus placement, wherever you are, make the most of everything! What’s the point of sitting around staring at a laptop screen, refreshing your Facebook news feed every 5 minutes?! Go out and explore! You’re only living in a certain place for a short period of time. Say ‘yes’ to the crazy opportunities that you’re bound to be asked because you might not get another opportunity to experience them! 6. Take up an activity that you probably wouldn’t have done in your home country. I live right next to some basketball courts and I spontaneously decided to buy a basketball and go down to the courts for hours on end and it proved to be a really relaxing, therapeutic stress relief!